The Grove Resort was the perfect location for Carly and Andrew’s Dr. Who inspired wedding. Located off Hwy 192 in Kissimmee, The Grove is a beautiful location to get married. With landscaped grounds, beautiful ballrooms, and a giant covered pier that seats 100+, this place has it all. http://pavoneevents.com/Pavone Events worked tirelessly to make sure that every detail was taken care of. From fan and favors, to making sure boutonnieres were pinned and dressed fluffed; they took care of it all. Elegant Entertainment provided the DJ for both the ceremony and the reception. They really kept the dance floor rockin into the night. Edmund Rhodes of Rhodes Studios captured every detail from their getting ready shots to the last dance, the cake cutting to Carly’s Dr. Who blue shoes. 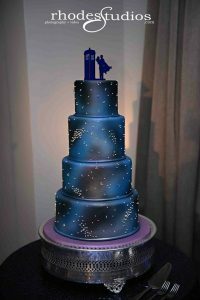 The Tardis themed cake by Couture Cakes was out of this world. There are many reasons why I love Andy. First off, I have never meet someone I could truly be myself around. I mean he let me plan our wedding around my love for Doctor Who, but I think he was okay with it because it also incorporated his love for space. I love when he goes on and on about space, even though he doesn’t think I am listening sometimes, when I really am. I love that he has a passion for space and has a goal to explore that vast wonder. I love that we can be our goofy, nerdy selves around each other and get a good laugh from one another. I love that I have meet my match, my soulmate, and I couldn’t have asked for a better one, because I love how much he loves me, but I certainly love him most. d them, and I have never met anyone in my life that has this greater than Carly. If more people were like her, the world would absolutely be a better place. This is only one of many reasons why I love her, and partly why I want to spend the rest of my life with her. Congratulations Andrew and Carly. We wish you happiness for a lifetime!